For 2019, the Lunar New Year begins on Tuesday, February 5. The Jing Ying Institute of Kung Fu & tai Chi will be hosting our annual celebration to help usher in the Year of the Boar. Normally the celebration lasts two weeks, but since we have so many wonderful activities, we extend that period. These events are open to the general public and do not require any previous experience. We recommend that you register in advance for any workshops you would like to attend since they often fill up. You may register at the door, but it will be on a "space-available" basis. We recommend that you arrive 10 to 15 minutes early to any events to check in or register as needed. The Tea Tasting has limited seating and has already started filling up, so register ASAP. Two FREE Homeschool Classes (11am to noon AND 12:30 to 1:30pm) - Join us one of our free homeschool kung fu classes. Open to ages 5 to adult. Enjoy the benefits of our Kung Fu program in a daytime class specifically for homeschoolers! The new session begins Friday, February 8. Click on the Homeschool Kung Fu link below for more information. Traditions of the Chinese New Year, Workshop for Families from 1:45 pm to 2:45 pm. Learn more about Chinese culture with information about Lunar New Year Traditions. Participants will get to sample some traditional treats and will receive a hong bao (red envelope) that will contain a small amount of money. New this year: We've designed this workshop to be before the start of the Lunar New Year (February 5 this year) so we can have activities that allow participants to prepare for the Lunar New Year in their own home. $3/person or $5/family is suggested to cover the cost of supplies. Presented by Wendy Ng. A Very Special Tea Tasting from 6:30 pm to 8:00 pm. Looking for something fun to do on a Friday evening? This informative workshop is presented by The East West Tea Emporium of Annapolis and is led by Lynayn Mielke, a tea professional with Level IV Certification from the Specialty Tea Institute. You’ll get to try several teas from China, learn about their proper preparation, and learn about their health benefits. You will also enjoy some light refreshments. Lynayn is a fun and engaging speaker, and you will walk away from the event knowing more about tea than you ever thought possible! Did you know that it is the most widely consumed beverage in the world? That there are more than 3,000 varieties of the tea bush (cameillia sinensis) and that herbal "teas" aren't actually tea? Join us to find out so much more during this always-enjoyable, fun event. Seating is limited, so register soon! Because of the popularity of this event, you must pre-pay. No refunds will be given for cancellations less than 48 hours before the event. Use the link below to register on-line. For more information or to register by phone, call the Jing Ying Institute at 410-431-5200. Improve your chi with tea! Valentine's Day Tai Chi Class EARLY A.M. (7:30-8:30am) - This is our earliest-in-the-day class with a special sweet twist! If this is your first time, you can try the class out for free and only pay if you decide to continue to take classes. We will celebrate Valentine's Day with some fun tai chi exercises and a bit of healthy chocolate. Show someone you love and care for them by bringing them with you to class! 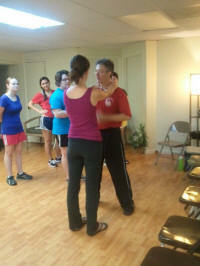 Valentine's Day Tai Chi Class (7:00-8:00pm) - Enjoy a tai chi class with a special sweet twist. If this is your first time, you can try the class out for free and only pay if you decide to continue to take classes. We will celebrate Valentine's Day with some fun tai chi exercises and a bit of healthy chocolate. Show someone you love and care for them by bringing them with you to class! ** Rescheduled for Friday, Feb 15 ** Chinese Calligraphy workshop from 6:00 pm to 7:30 pm. Learn basic brush strokes and characters from Chinese Calligraphy. We will focus on auspicious characters for the Chinese New Year, so you can create something to display at home. We supply paper, ink and brushes for use during class. Presented by Wendy Ng. Fee: $5 to cover cost of supplies. You must pre-pay to hold your spot. Free Introductory Kids Kung Fu Class from 12 pm to 1:00pm on Saturday, 2/16 and from 4:30 to 5:30 pm on Monday, 2/18. Suitable for children from 5 to 10, this workshop will include an introductory lesson in Kung Fu, will provide information on Chinese New Year, and will teach some of the basics of Chinese Lion Dance. A parent/guardian is welcome to join the class. A child-size lion head is available for the kids to use along with drums, cymbals and a gong. Please arrive 10 minutes early to check in. Free Open House with refreshments and entertainment from 3:00 pm to 5:00 pm. Bring your friends and family to enjoy the fun. The entertainment, crafts, food, and EcoAdventures experience are all FREE. There will be several giveaways and contests to add to the fun. Lion Dance Performance at 3:15 pm, followed by demonstrations of Tai Chi, Kung Fu forms and weapons. The Chinese Lion Dance is often confused with the Dragon Dance. Both are a part of Chinese New Year and other traditional Chinese festivities. The Chinese Lion Dance is performed by two people, wearing a Lion Dance costume, and the Dragon Dance is performed by many more people. Bring some cash to "feed" the lion during its ceremonial dance. Jing Ying will provide the hong bao (red envelope) in which to place the money. This is supposed to bring good luck to the giver, and the more given, the better the luck! The money will be donated to charity. Year of the Boar Craft Activities - have fun with origami and other theme-related crafts and learn more about the traditions of the Lunar New Year.ds! Silent Auction for Orphan Grain Train(Auction closes at 4:30pm). This year we are hosting a Lunar New Year silent_auction, and the funds raised will go to Orphan Grain Train (OGT). If you would like to donate, please contact us at 410-431-5200. Free Tai Chi Class ("Moving Meditation") from 3:45-4:30pm. Discover how this ancient and low-impact form of exercise promotes joint health, improves flexibility and strength; improves balance and helps prevent falls; helps with arthritis, blood pressure, diabetes and chronic conditions such as fibromyalgia; and increases bone density. Join us for this new afternoon class! We will practice basic tai chi & qigong movements and silk-reeling exercises. You have the option of staying seated for all or part of the workshop (we encourage you to stay within your comfort zone). This workshop is suitable for all levels of fitness. Free. Self-defense Workshop for Women & Teen Girls from 2:00 pm to 4:00 pm. This will be geared for teens and adults. Learn basic skills for avoiding trouble and protecting yourself. The workshop will start with a discussion on safety to help you avoid trouble. That will be followed with a lesson on escape techniques for situations you may not be able to avoid. Finally, self-defense techniques will be covered for fighting back when you aren't able to escape easily. During the Lunar New Year, we offer this self-defense workshop at a low cost as a service to our local community. We have listed two prices below from which you can choose to pay. 100% of the proceeds go to The Bernie House, a single-family transitional home for the non-offending parent and children who have left an abusive situation (www.TheBernieHouse.org). "My teenage daughter attended one of your self-defense workshops for women, and I believe it helped prevent her abduction. Two men tried to drag her into a truck, and she was able to escape using your techniques." Class size is limited, so we recommend that you register as soon as possible. Last year the workshop was full about a week beforehand, and we could no longer accept new registrations. You must pre-pay to hold your spot. If this date does not work for you, you can schedule a workshop for your group (examples: scouts, moms groups, church groups). We will also hold our annual Self-Defense Workshop for College Students in July or August based on interest. * 100% of the proceeds from the self defense workshop will go to The Bernie House, a single-family transitional home for the non-offending parent and children who have left an abusive situation (www.TheBernieHouse.org). Click on the above button if you would like to pay $25/person, or click on the button below if you would like to pay $30/person. Of	course,	you may donate more in person.